Corneal Cross-linking (CXL) targets the underlying cause of keratoconus. At VISTAeyes we have reduced the treatment time to 30 minutes rather then a full hour, minimising discomfort for our patients. Keratoconus is a degenerative condition of the eye that involves thinning of the cornea (the transparent, front surface of the eye). As a result of the thinning, the normal shape of the cornea becomes distorted and a cone-shaped bulge develops; resulting in a progressive blurring of the vision. People who suffer from keratoconus can experience distortion of their vision including multiple images, sensitivity to light and ‘streaking’. The level of visual distortion can vary but if both eyes are affected keratoconus can interfere with the ability to read or drive a car. Keratoconus typically develops between the ages of 16 and 30 years of age and although the exact cause remains unknown; recent research indicates there may be a genetic origin. Excessive eye rubbing could also be a contributing risk factor. People who suffer from keratoconus usually wear glasses or hard/rigid contact lenses to treat their blurry vision. However, if your keratoconus is severe glasses may not provide a good quality vision and if you suffer from allergies or dry eyes, contact lens wear can become problematic. How can Corneal Cross-Linking (CXL) help? The collagen fibres in your cornea are arranged, by nature, in such a way to maximise its strength. When weakened by keratoconus, these fibres can slip distorting the shape of the cornea and results in a gradual blurring or loss in visual clarity. Corneal Cross-Linking (CXL), also known as “corneal collagen cross-linking”, strengthens the corneal fibres and can prevent further weakening. In reinforcing the structure of the cornea, research has shown that vision can be stabilised. Glasses and contact lenses seek to address the blurring of the vision experienced by those with keratoconus but neither of these treatments directly addresses the cause of the problem: the weakness in the cornea. CXL typically increases corneal strength by up to 300%. Corneal Cross-Linking (CXL) is well known in medicine, where it is used in restoring heart valves, arterial grafts and joint cartilage. Theo Seiler, MD, Professor of Ophthalmology at Dresden Technical University in Germany, was in the dental chair when his dentist told him of cross-linking of tooth fillings with blue light in order to harden them. In a moment of inspiration he conceived the idea of corneal cross-linking. He worked with a team of scientists to develop the technique and the first CXL treatment was performed in 1998. The first publication of results came in 2003. Twenty three eyes with progressive keratoconus were treated with CXL. The results were positive: in all cases, the keratoconus progression stopped, the corneas flattened, and vision actually improved. This landmark study was the first of many more comprehensive studies to follow. Since then, results of similar such studies have shown positive outcomes. How does Corneal Cross-Linking work (CXL)? These are several methods used by surgeons performing CXL. In all treatments, UV light is combined with riboflavin (Vitamin B2) to strengthen the cornea. A solution of riboflavin is dropped onto the eye for several minutes before the cornea is exposed to a low intensity UV light source. The resultant photochemical reaction that occurs during this process strengthens the collagen fibres within the cornea. Standard epithelium-off CXL was the original technique. 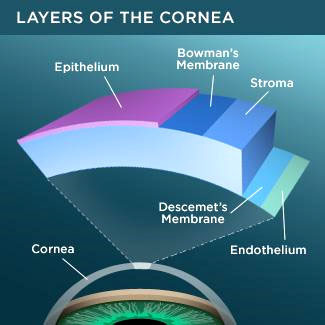 The skin (epithelium) of the cornea is removed prior to the riboflavin being applied. This process takes one hour and the eye heals over the coming week. This procedure is much the same as standard epithelium-off CXL except it uses a higher powered UV light for a shorter period of time. By minimising the treatment time by more than half, patient comfort can be maximised and anxiety reduced. May potentially reduce some of the risks involved with other types of CXL. Need more information about Corneal Cross-Linking (CXL)? Please contact us to book a consultation.